Last weekend marked the earliest close to the onion harvest season in history. Never before have we been able to finish a season so quickly here in Nyssa, Oregon. We owe it to the nearly perfect conditions that allowed the season to move steadily along. Initially, ideal warm weather matured our onions quickly which allowed us to start our harvest season earlier this year, at the end of July. By starting earlier, and harvesting our early varieties sooner, we were able to harvest later varieties sooner too. Additionally, harvest weather conditions were warm and dry – allowing three solid weeks of steady harvest with only a single day of rain. With no interruptions, the harvest progressed quickly without complications or damage from weather conditions. Now that ground harvest is finished, we will be supplying the market with our storage onions for the rest of our shipping season. Our onion fields will rest, or be planted with alternate crops to keep the soil healthy and ready for next season. The valley is 1,300 loads ahead of last years’ numbers this time last year. This milestone season is a great indicator of seasons to come. Watch our harvest video below! This year Froerer Farms had their longest growing season on record for asparagus. The Froerer family started growing asparagus in the 1990’s. During the past two decades the usual season had an average of 40 packing days, but this year Owyhee Produce fresh packed for 57 days. Farm Manager Craig Froerer said, “The crop started earlier because of warmer weather. The youngest fields are in their fourth year, and were heavily picked this year. In three years they will be in full production. Over the next three years [the asparagus’s] health and maturity will improve.” In other words there is an upward trend in asparagus which doesn’t show signs of slowing. 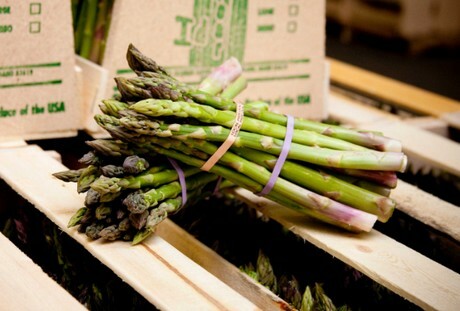 “All I equate [asparagus] to is a lot of hard work,” Packing Manager Robin Froerer explained. About 100 pickers harvested over 140 acres twice a day. For the first time ever Froerer Farms had to deal with a shortage of labor on the packaging side of business. Despite this set back the Owyhee Produce and IDA Spear merger has flourished. Since the January 2015 merger Owyhee Produce’s ability to provide benefits to their joined customers has increased. More employees are available to take customer calls and questions. Also, there are more employees to help with the logistics of shipping. “Our asparagus season is off to the earliest start in 25 years,” said Robin Froerer with Owyhee Produce. “We’ve experienced unseasonably warm weather and already started picking in March,” Froerer added. In an average season, picking starts between April 15 and April 20. “Although we’ve been picking for a few weeks, volumes are still light. This is mainly caused by last week’s cold spell when we lost some of our production to frost.” As the weather warms up again, volumes will become heavier. 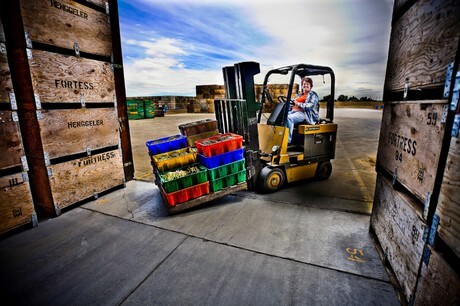 Owyhee Produce ships its asparagus all over the United States to mainstream retailers like Albertson’s, Winco’s and Walmart. Additionally, the company also is a supplier to the foodservice industry. Over the last 5-8 years we have dramatically improved our ability to extend the storage-onion shipping season. The combination of hearty storage varieties, cold storages, and sprout inhibitors means that many we can now supply onions from right here in Oregon for 10 months of the year. However, with the advantage these better skinned varieties come with there are also a few characteristics that must be managed in order to minimize shrink and maximize profits. Later in the season you may begin to see green specks in the center of the onions. This little green speck is what we call an internal sprout. This happens naturally as the onion goes through its life cycle and this is a very manageable issue. If an onion is kept cool it will take, at least, several weeks for the internal sprouts to become external ones. Plan on keeping onions for 3 weeks during the later part of the storage season… treat them a bit more like you might an apple.